THE STRAWBERRY MALLARD: Time To Dress Up Angus! ....come on ma, I'm a scottie, not a poodle............."
Sigh.................."nobody knows.......the trouble I've seen...........nobody knows my sorrow.......sorrow!" "Whew ~ at least she let me put on my thinking cap ~ not that I have a lot to think about ~ what do I think about all day anyway? 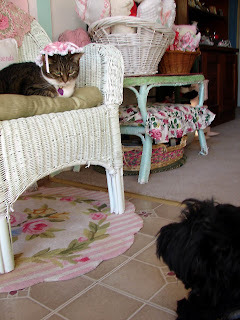 Cookies, eating, sleeping, barking, chasing Bootsie.........not much else for me to do............"
"I see that ma got to you too today kitty ~ sure hope it warms up soon so she'll find something else to work on in the garden!!!" How do you all dress up your dogs ( or cats.....or bunnies....or birdies.........) when you want to make them feel "special?" Inquiring minds want to know!!! So funny! I love the cat part :) Once while we were over at my sister's I found my 2 year old had dressed up the cat by laying a necklace & hat & a shirt on it in the right places. The cat never even moved :) It was cute! Thanks for coming by my blog! What a sweet message you left about Annie! Thanks very much! You should have seen Lilly trying to hide this morning when I got out her rain coat - I didn't want her to get covered with snow balls. Piper is really good about wearing his coat and Carrleigh would wear clothes all the time if I'd let her! 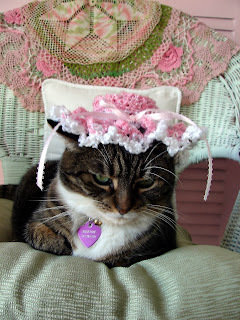 May I copy the picture of your kitty with the hat on? that is one of my favorite art themes...especially in artist's trading cards...cats in hats! !